Lock in a great price for Caledonian – rated 8.3 by recent guests! It is a very plain hotel, there is nothing special about it, you go sleep, shower and that is all, for that price the at least should have tooth paste in the toilets, so to me it felt more like a good hostel than a 3 star hotel. Over charged for the MWC2019, real shame how the take advantage of the business traveler. Very central. Nice spacious rooms. Very helpful and friendly staff. Location was great, rooms very clean, comfortable beds and kind staff. Will definitely return. Location was very good.Walking distance to Batllo House and main avenue with shops. Around 20' walk to main square plaza. This hotel is very near to the major metro station and a short walk to the airport bus stop. The location is excellent-walking distance to almost everything. The staff are very friendly and helpful and the room is decent and clean. The location is ok. The facilities are quite old but still comfortable. Great breakfast. Room was good sized, but not much air flow. Asked for a fan & it was there when we returned. Caledonian This rating is a reflection of how the property compares to the industry standard when it comes to price, facilities and services available. It's based on a self-evaluation by the property. Use this rating to help choose your stay! One of our top picks in Barcelona.The Caledonian has an ideal setting on Barcelona's Gran Vía, just a 5-minute walk from Plaza de Catalunya and Las Ramblas. Its rooms include free Wi-Fi internet access. The air-conditioned rooms at the Caledonian feature simple, attractive décor with hardwood floors. Each has a minibar and some rooms offer views of Gran Vía. The hotel serves a daily buffet breakfast in its dining room. There is a good selection of restaurants within a 10-minute walk of the Caledonian. Universitat Metro Station is just 300 feet from the hotel and connects guests to sights such as Gaudí’s La Perdrera and the Sagrada Familia within 15 minutes. Guests can use services such as the 24-hour front desk and express check-in and check-out. The hotel also has luggage storage. When would you like to stay at Caledonian? This comfortable, air-conditioned room features a safe, mini-bar and free Wi-Fi. The private bathroom has a bath and hairdryer. Private parking is available on site (reservation is not needed) and costs EUR 19.26 per day. These rooms on the top floor have a terrace with great views of the city. House Rules Caledonian takes special requests – add in the next step! Caledonian accepts these cards and reserves the right to temporarily hold an amount prior to arrival. Bath tub was leaking and some water was coming out to the room floor. For us it wasn't a problem but it definitely needs to be fixed. Pillows are a bit thin and bed covers/blankets need to be renewed. The location is perfect. Rooms are clean, beds comfy, good size. We were on the 5th floor and the view was quite nice. The street is a bit noisy but when you close the balcony door no noise is coming in. Staff is very helpful, offered is to keep luggage for free after check-out and use a very comfy sofas in the lobby plus the toilets before we went to the airport. Great location. Breakfast was excellent value for money. Plenty of variety and lots of food! Bathroom was very small and sofa bed was not very comfortable. Location, staff at reception were very helpful and attentive. Very impressed. Worth the money, room is very big and comfortable. Had breakfast one day only. I need only toast and coffee. Had to pay 12e. No where to rest and hang about outside of room. No English channel on tv or radio for music? Great coffee shop next door. El door. Location. Price. Quiet single room. Plastic cups instead of glasses and no tea facilities. TV does not work. I did not like that fact that their check in is a 2pm and their check out at 12 noon, I arrived at 8am to Barcelona and I had to wait 6 hours to get in my room, they never offered me another room even dough I offered them to pay additional. The single room was like a cargo ships crew cabin, it was the tiniest room I have ever seen. 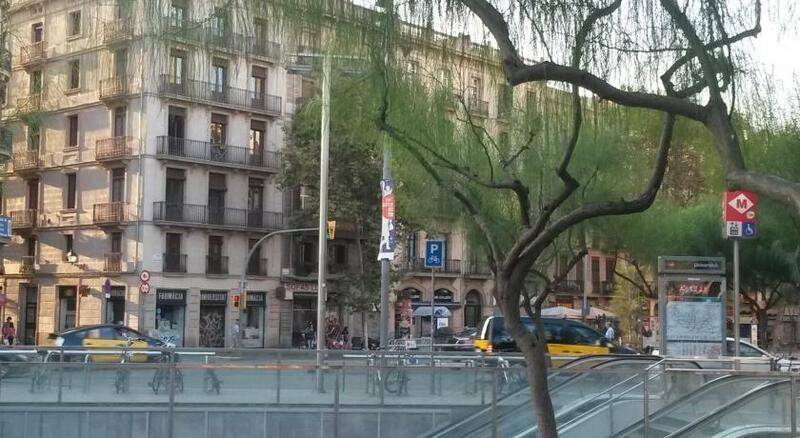 Great location , close to a metro station Universität, short walk to La Rambla. The staff were very friendly. Clean and comfortable hotel. Good value for money. There was a problem with the light in my room. It kept flashing. I complained to two different staff. When they wouldn’t fix it I insisted on a new room. I practically had to beg. It felt weird and I didn’t understand why they couldn’t just move me. The location was great and the staff were nice. The hotel was clean, safe and quiet.